Address: 8811 S. Old Oregon Inlet Rd. Ocean Front-South Nags Head. 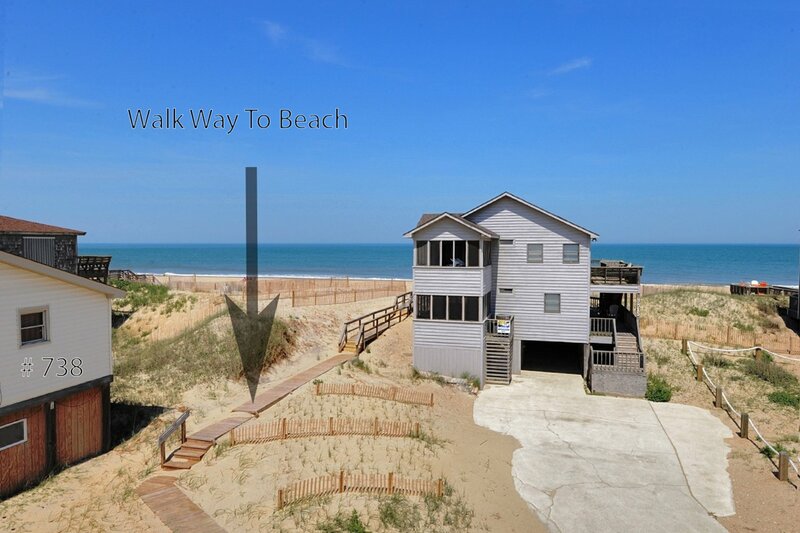 "Acree Beach House" is a lovely family beach cottage that offers small families the opportunity to enjoy Nags Head the way it used to be. Beautiful hardwood floors, all new furnishings, island breakfast/dining bar, covered deck, & ocean views make this the perfect locale for a relaxing family retreat. Enjoy the morning sunrise over the Atlantic, long walks on the shore & fun filled days basking in the sun while playing on the wide beach. The updated decor gives it a warm & cozy feeling that will make you feel right at home. Located in peaceful South Nags Head, you can walk to Fishhead’s Bar & Grill at the Outer Banks Fishing Pier. Great shopping & dining are a short bike ride or drive away. Ground Level: Parking for 3 Cars, Carport, Storage Area w/Laundry, Outside Shower, & Shared Walkway to Beach. Main Level: Living/Dining/Kitchen Combo, Ocean Views, 2 Smart Flat Screen TV’s (48 Inch & 40 Inch), Queen Sleep Sofa, Hardwood Floors, Island Bar Dining, 3 Bedrooms (Master Suite w/Queen, TV, & Full Bath, 1 w/Queen, 1 w/2 Singles), Full Hall Bath, & a Covered Oceanfront Deck. Features include: C/AC & Heat, Washer/Dryer, Microwave, Phone, 2 Samsung Smart TVs, Blu-Ray DVD, Wireless Internet, & Deck Furniture. No Pets, This is a Non-Smoking Unit. Link to Facebook page Click Here. Compliment: the sliding glass doors were so clean that our son ran into them trying to go outside. He thought they were open! Love the location. Cute house. The home was clean, and the furnishings were nicely thought out for a beach house. We had a feeling of comfort during our stay at this home. We really liked having the private driveway and outdoor shower, too!! It was a lovely place to spend a beautiful week with family and we would love to come back for future family get- aways. Love this house and the bed!!! Oh the bed!!! Best mattress! Love the view on porch ! We will be back not next year the year after. We come to OBX every other year. Overall my family of four had a great experience. The remodel looks great and the house had everything we needed for our stay. Absolutely loved every aspect of our vacation - the accommodations and location were perfect for our family. This home is beautiful furnished and it made the perfect beach cottage for us. This is a small but truly gorgeous home. One of the most beautifully decorated I have stayed in at the beach.We loved it. The house was recently renovated which is why I chose it. The furniture and decor was well picked out and they didn't skimp on flimsy cheap furniture. I was very happy with our stay. This house is in an excellent location if you want a quiet place that's close to everything. Very comfortable furniture, very clean! Cute little house!